Bentonite Market size was over USD 1.1 billion in 2017 and industry expects consumption above 25 million tons by 2024. Rising infrastructural growth in China, India, Japan and Malaysia owing to increased public expenditure is predicted to boost the construction industry and thereby accelerate bentonite market size. Southeast Asia construction market led by Malaysia, Indonesia and Singapore was valued at USD 250 billion in 2018 which indicates tremendous market growth potential. Bentonite finds usage in tunneling, building waterproof screens, slurry walls, waterproofing foundations and stabilization of casings. This product possesses unique plasticizing properties which make it ideal for the preparation of grouts and injections for filling voids and patching cracks. These products are highly suitable in the construction of dams, hydropower plants, ponds, sea canals, and basements of industrial and residential buildings which may stimulate the market growth. Increasing environmental concerns regarding wastewater treatment owing to high content of toxic and radioactive chemicals may promote bentonite market growth. Wastewaters generally possess high chemical oxygen demand causing mortality risk to aquatic animals along with imparting undesirable odor & dirt. In 2016, approximately 70% of wastewater in Central & Southern Asia and 65% in Latin America remained untreated, which represents ample growth potential for the market. These products are used in wastewater treatment for the removal of organic substances, heavy metal and nutrients on account of their high surface area and overall negative charge which helps absorb organic & inorganic cations. Low product price, ease of availability and high adsorption capabilities may increase product demand for wastewater treatment applications. Growing awareness of bentonite’s adverse health and environmental impacts may restrain market growth. The chemicals used in drill fluid for oil & gas extraction may contaminate groundwater sources and such activities are regulated by the Safe Drinking Water Act in the U.S. This product when consumed as detox clay poses significant risk of lead consumption which may cause brain and kidney damage. Moreover, the product’s widespread use in pet litter presents the risk of pets suffering toxic or carcinogenic effects in case of ingestion. 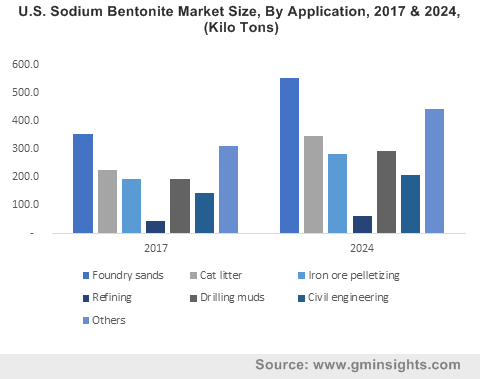 Sodium bentonite market demand from foundry sands applications was valued over USD 190 million in 2017. This product possesses the ability to absorb large amounts of water and swell to a large volume, high viscosity, high alkalinity, high strength formation and thermal stability. This product is used in the foundry industry as a binder to improve product quality, productivity and minimize scrap generation, thereby stimulating market growth. Calcium bentonite market size from refining applications is likely to witness gains over 3.5% by 2024. This product possesses high acid content which ensures heavy metal and gum removal, and a high activation degree which allows it to react with impurities present in oil, thereby reducing refinery time and enhancing efficiency. This product finds use in various industrial oils such as dark oils, lubricants, diesel fuel, used edible oil and disposed engine oil, which may boost growth of bentonite industry size. Sulphur bentonite market size is predicted to surpass USD 275 million in the forecasted timeframe. It protects the cutting tools from corrosion, provides lubrication, and has a cooling effect. This product generates hydrostatic pressure thereby preventing formation fluids from penetrating the well bore, which may boost product demand. North America, driven by Canada, Mexico, and the U.S. bentonite market size may witness gains at over 5% by 2024. The region is witnessing rising oil & gas exploration to reduce energy dependency on imports which has led to increased drilling activities. These products possess high viscosity owing to presence of water in drilling fluid along with increase in borehole stability, thus stimulating the market growth. Asia Pacific led by India, Japan, South Korea, and China bentonite market demand is poised to exceed USD 520 million up to 2024. This region has experienced a significant rise in construction activities and automotive manufacturing owing to urbanization and population growth which has further boosted the iron pelletizing industry. It is used as a binding agent to maintain the integrity of iron ore pellets, increase their heat resistance and impart high strength which allows long distance transport, thereby stimulating industry growth. Europe bentonite market size led by UK, Germany, France and Spain may witness gains of over 4.5% during the forecast timeframe. This region is witnessing an increasing demand for clay-based litter products for improved odor, hygiene, and convenient cleaning of litter boxes. These products rapidly absorb moisture and their particles clump together effectively trapping pet waste, which may accelerate market growth. Bentonite market share is significantly competitive and moderately fragmented among several key industry participants such as Mineral Technologies, Delmon Group of Companies, CETCO, Black Hills Bentonite, and Halliburton. Manufacturing companies are focusing on strategic agreements and collaborations to expand production capacity. 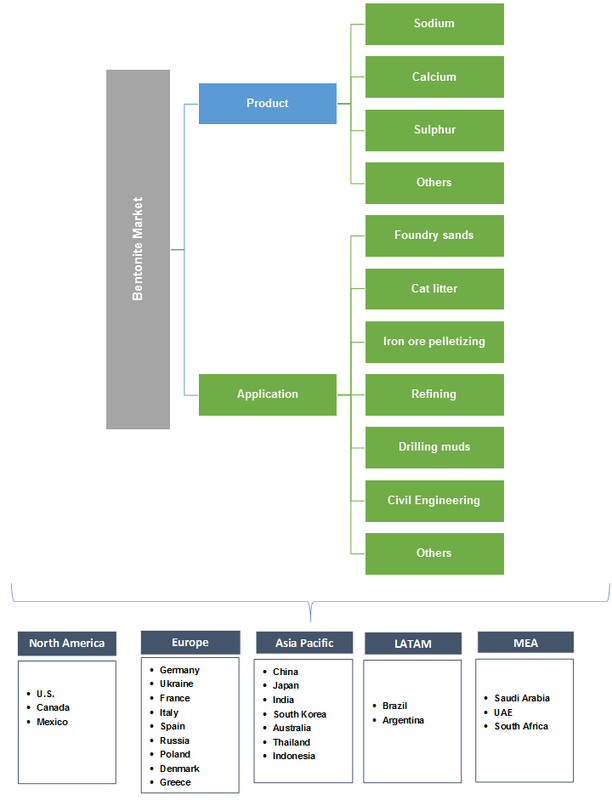 Moreover, several manufacturers are focusing on enhancing their mining operations to increase raw material availability, reduce costs and achieve competitive advantage, which may promote bentonite market growth. Bentonite is a type of clay derived from ancient volcanic activity primarily comprising of montmorillonite. This product is odorless, natural, non-corrosive and chemically inert. This product possesses the property to swell and increase in volume when exposed to water which helps to alleviate the enormous stress in trenchless construction, thus increasing bentonite demand. These products are utilized in foundry, cat litter, oil refineries, drilling, iron ore pelletizing and civil engineering industries. Increasing demand of these products owing to rapid urbanization, population rise, increasing disposable income and public infrastructure growth in China & India may accelerate growth of bentonite market size.